Our succulent dinner begins with premium chuck roast, slow braised in a classic blend of herbs and spices. Hand shredded and piled high on fresh sourdough bread with savory beef stock gravy. It’s tender, it’s juicy and it goes superbly with your choice of any two Classic Sides. Green Beans : Green Beans, Diced Red Onions, Butter (Cream, Salt), Salt, Pepper. 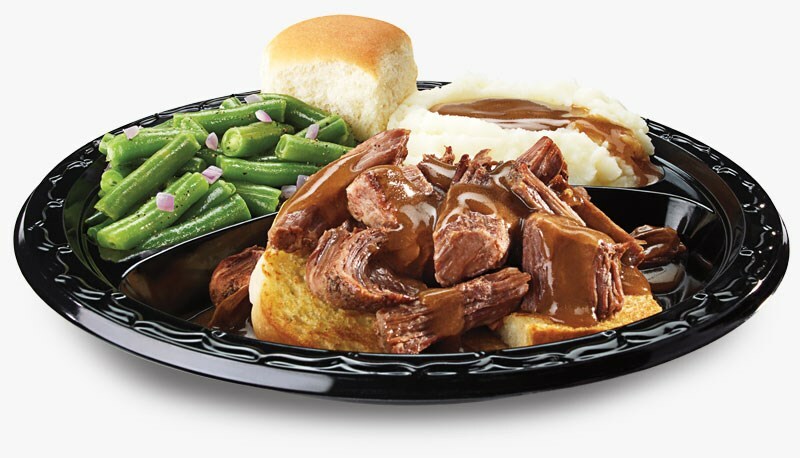 Beef Pot Roast : Beef, 20% Solution Of Water, Dextrose, Salt, Sodium Phosphate, Sugar, Cooked With Water, Raw Onions, Dextrose, Flavoring, Sugar, Salt, Yeast Extract, Hydrolyzed Corn Gluten, Sunflower Oil, Caramel Color.